Curious if anyone has experience with these. Ive heard they are rather inaccurate? Does anyone familiar with these think theyd be useful as a PDW or would you be more comfortable with just a Glock? I have had both an MPA 9mm & 45ACP. while somewhat bulky they were surprisingly accurate for what they are and the price. simple, easy to clean/maintain, reliable I have nothing but good things to say about them. I just bought an MPA 30SST with the intent to SBR it and throw a stock on it. I am taking to the range saturday and will let you know what I think. So far, the build quality really impressed me. I put 100 rounds through it today and it shot surprisingly well. I really wish it had a stock. I may throw a pistol brace on it until I get a stamp. I have one SBR'd and it is super easy to bump fire with a loose grip and hooked trigger finger. The trigger pull and reset are perfect for it. Love mine. I got mine to bump accidentally. Got a couple 2 and 3 shot bursts out of it. I have two MPA's, one a mini-9 and the other a full sized that has been PDW'd. They both shoot terrifically and I've had no problems with the full sized 9, though the mini did break a hammer a ways back, but I sent the weapon in and they replaced the Hammer and updated the gun itself with several much appreciated features (Proper sights, New mag release, etc etc). I've put about 500 rounds through each and have had no problems with them since. I've been thinking hard about one of those lately. A buddy of mine has one with an arm brace and it's a darn good shooter. I just put a MPA930 in lay a way. Ill get it out when I get home from vacation. They have really good reviews. Can't wait to try it out. MPA9mm - I have an older fullsize model that I purchased because it was cheap ($200) and I already had a buttload of STEN mags. The gun works flawlessly but the hammer and/or sear plate can wear with use. However, these are cheap and available directly from MPA. It is inaccurate but only because it has the ergonomics of a clay brick and primitive sights (mine has the earlier MAC11 style sights). People complain of the SLAP trigger but I kinda like it. Once you get into the cadence of fire, you can mag dump pretty fast. Not full-auto fast but still pretty fast and stay reasonably on target. IF this were the only gun available you could make it work as a defensive weapon but probably not for CC. Glock - Frankly, a G17 with a few 32 round G18 mags does EVERYTHING the MPA will do but better. Summary: The MPA is a well-built gun. The best of the semi-auto MAC-style guns. IT has a cool factor of 100% but in the end, it is still better relegated to "range toy" status, which is still a good reason to get one! A SigBrace fitted to an adapter available from MPA might change the real World usefulness. FWIW- MPA offers OUTSTANDING Customer Service! I purchased mine used and MPA was more than happy to take time and answer all my questions about the gun and they even offered to give it a free inspection if I wanted to send it in. It wasn't giving me any problems so I declined. I ran 100 rds thru my new MPA930T-AC. I am impressed with it and very happy about the price. I can shoot it more accuratly than I thought that I would be able to. It has good sights and a very smooth trigger. 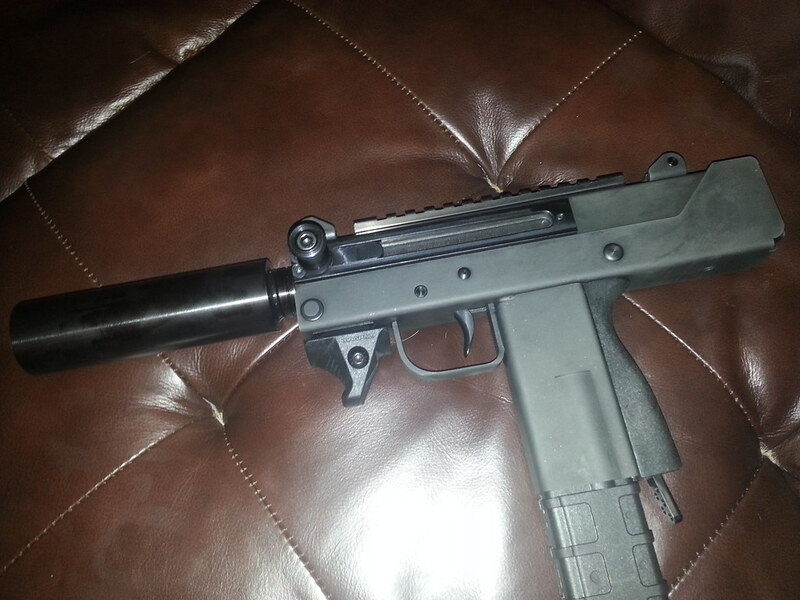 This thing bump fires faster than some full autos that I have fired.